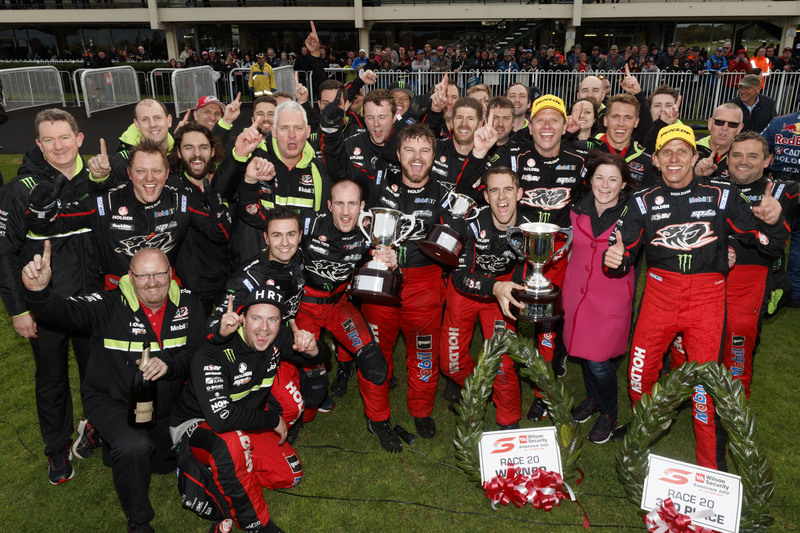 Lost in the hubbub of a great race finish at the Wilson Security Sandown 500 was the fact that Garth Tander and Warren Luff have become winners number 11 and 12 in a stellar Supercars season. That’s been achieved in 20 races so far in 2016. To the same point past Sandown in 2015 it was 10 winners from 24 races, in 2014 12 from 29 and in 2013 – the first year of the NewGen cars – it was 13 from 28. There’s every chance of more winners being added to the list before the championship wraps up in Sydney, with leading drivers such as Chaz Mostert and Fabian Coulthard yet to break through this year. This was Supercars race win number 54 for Tander and number three for Luff, who previously scored twice when co-driving with Craig Lowndes at Triple Eight in 2012, including that year’s 500. Finding himself driving a competitive Holden Racing Team Commodore at Sandown, we got what Tander always delivers; a tough, pugnacious drive and an equally forthright perspective on the race at the press conference afterwards. But Luff’s performance was better than expected; his opening stint in difficult conditions was simply outstanding and played a key role in the race win – as Tander acknowledged afterwards. The team’s other car, the #22 of James Courtney and Jack Perkins, would have been in contention for the podium too if not for a communications miscue that saw them stay out when the safety car appeared on lap 55. Two competitive HRT Commodore at Bathurst mixing it up with T8, PRA, Penske and co? Sounds great, especially remembering HRT hasn’t got to race day at Mount Panorama intact since 2013, as it lost a car when Luff crashed pre-race in 2014 and Courtney was out injured last year. 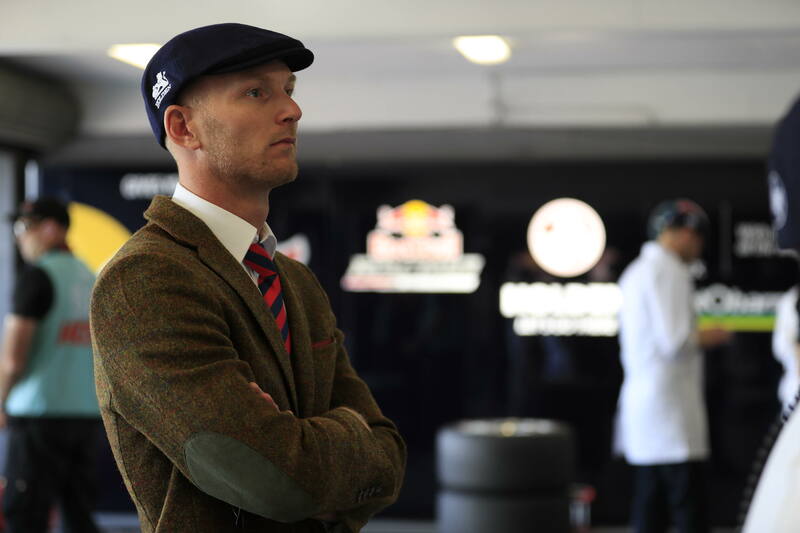 Luff was one of the positive co-driver stories for the weekend, as was Alex Premat in the second-placed Red Bull Commodore. The Frenchman vindicated team boss Roland Dane’s decision to hire him away from Garry Rogers Motorsport with a faultless drive, that helped Shane van Gisbergen jump Jamie Whincup into the championship lead. Premat’s two fellow co-drivers at T8, Paul Dumbrell and Steven Richards, couldn’t claim the same positive outcome. Incredibly, Richo has yet to win the Sandown 500, despite claiming four Bathurst 1000s. Kiwi Richie Stanaway was another international to show great poise and pace on debut in the Super Black Racing Ice Break Ford Falcon and post-race expressed his desire to race full-time in the championship as soon as next year. James Courtney was in the headlines at Sandown with leading motorsport journo (and supercars.com contributor) Mark Fogarty reporting he had signed a new deal with Walkinshaw Racing beyond 2016, when it becomes a privateer team and hands over the Holden Racing Team name to Triple Eight. Predictably, all parties involved are staying publicly tight-lipped on the situation, but if it pans out this way then it makes a lot of sense; Courtney is an A+ driver and one of the biggest personalities in the championship and that would help WR find the commercial partners to mount a strong campaign going forward. What is to become of his team-mate Tander is less clear. He says his future is resolved but isn’t giving anything away about what that means, not even conceding he will be driving in Supercars next year. But this is the time of year when the driver movement action really heats up so expect lots of news over the next few weeks. 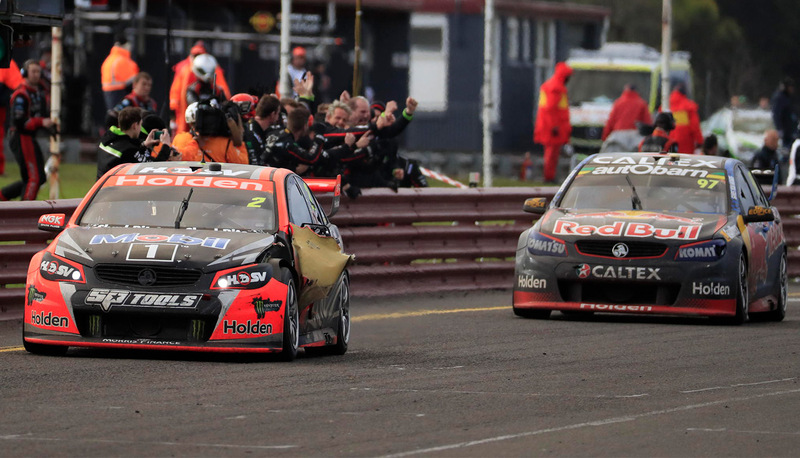 No-one was disputing that both Paul Dumbrell and Tim Slade made mistakes getting in and out of their seatbelts at Sandown, but did their cars deserve a drive-through for it? The question may not have come up if not for the ‘redress’ issue on Saturday where drivers were allowed to continue racing after knocking an opponent off the road, as long as they slowed and allowed said opponent to take station ahead, even if both of them were now several positions down the order. The redress issue caused confusion amongst at least some of the drivers and some genuine anger too, one ‘culprit’ admitting he felt he should have got a drive-through anyway for his injudicious pass. Great to see Scott McLaughlin up and about and feistily declaring himself ready to take on the Triple Eight machine in the fight for the drivers’ championship. 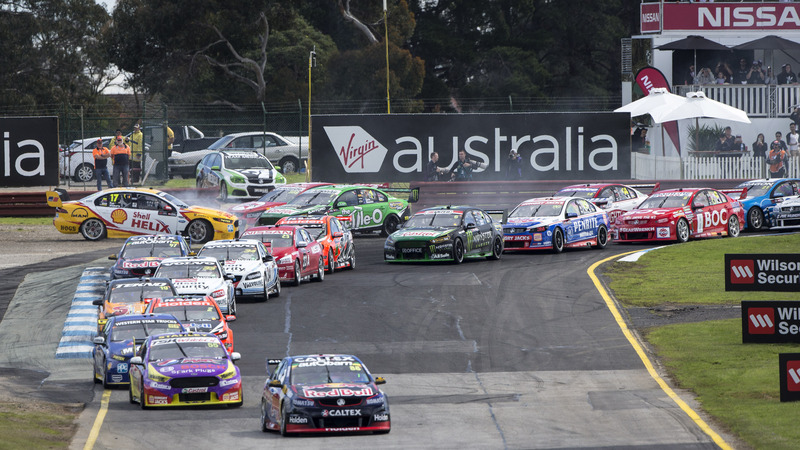 McLaughlin and Tander’s battle for the lead through the mid stages of the Sandown 500 was great entertainment. That Volvo handles well in a straight line doesn’t it! It was just a pity McLaughlin then took himself out of the fight for the win with his run-off on cold tyres after his last stop. He and David Wall might have found themselves on the podium rather than fourth. But Bathurst now beckons and another chance for him to grab a big haul of points. What a debut in the main game for James Golding! Thankfully he was fundamentally okay after that lap one smash and the car will be repaired for Bathurst. Let’s hope #34 goes back together with the same pace it has shown in the last few races, as after regular driver James Moffat qualified on row three in Sydney, he and ‘Bieber’ were on row two at Sandown, again alongside the usually dominant #33 entry. Moffat’s increasing competitiveness is incredibly important for the team as it prepares for the departure of McLaughlin and a bunch of other unknowns headed into 2017. 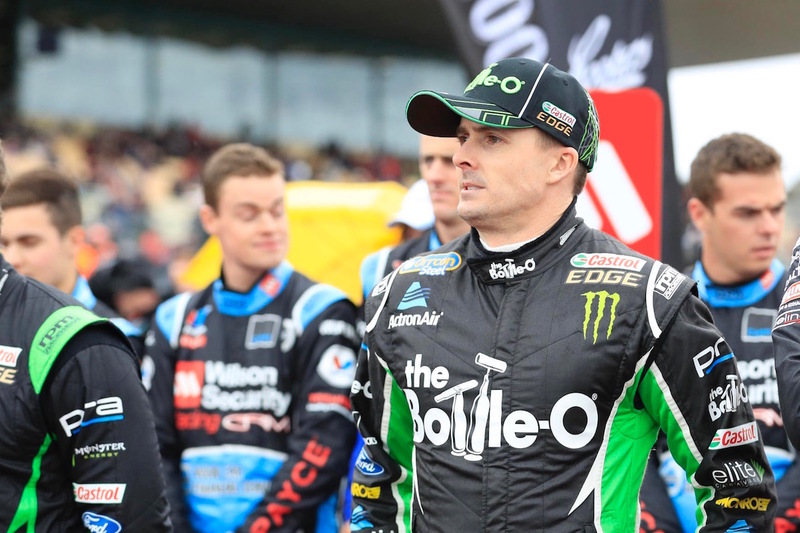 Mark Winterbottom’s title defence is off track and he knows it. He has managed one race win all year – in Perth, which was a great result and a great race – hasn’t finished on the podium since Townsville, couldn’t make it into the top 10 in Sydney and was a dismal 23rd after co-driver Dean Canto’s mistake at Sandown. With his PRA Falcon not working as well as the T8 Commodores, Winterbottom had adopted a ‘points make prizes’ philosophy, but of late that’s proved good in theory only. And based on recent history, Winterbottom is through the best part of his season. His last win in 2015 came at Sandown and 2014 – when he collapsed from the championship lead in the second half of the year – at Darwin in June. In 2013, of course, he scored that momentous Supercheap Auto Bathurst 1000 win and that’s the result he will be hoping for again this year. Otherwise, that 340 points gap to Shane van Gisbergen already looks impossible to peg back. Shout-out to the Supercars sporting and technical department and especially Melbourne-based Frank Adamson, who had to make the call on whether or not to meatball the #2 HRT Commodore late in the 500 when the left-front guard decided to turn into an airbrake. There was no guesswork involved in the decision as Adamson is closely involved in the build of all southern-based Supercars. So he knew exactly how that panel was attached to the body and what chance there was of it flying loose. With that knowledge onboard David Stuart’s crew could make the right call and we got the right result after an exciting finish.